Place the baby carrots in a large skilled with butter, honey and about ⅓ cup water. Heat over medium high heat and season the carrots with cumin, cayenne, salt and pepper and cook stirring occasionally, until lightly caramelized and tender, about 20 minutes. While the carrots are cooking, stir together the star anise, cumin, coriander and white pepper in small bowl. Season the duck breasts on both sides with salt, then crust the skin side of the duck breasts with the spice mixture. Divide the canola oil into 2 sauté pans and heat over medium heat. When the pans are hot, gently place two duck breasts, skin side down in each pan. Lower the heat to medium low and cook until skin is golden brown and crispy, about 12-15 minutes. Turn the duck breasts over and continue cooking for 3-4 minutes for medium rare. 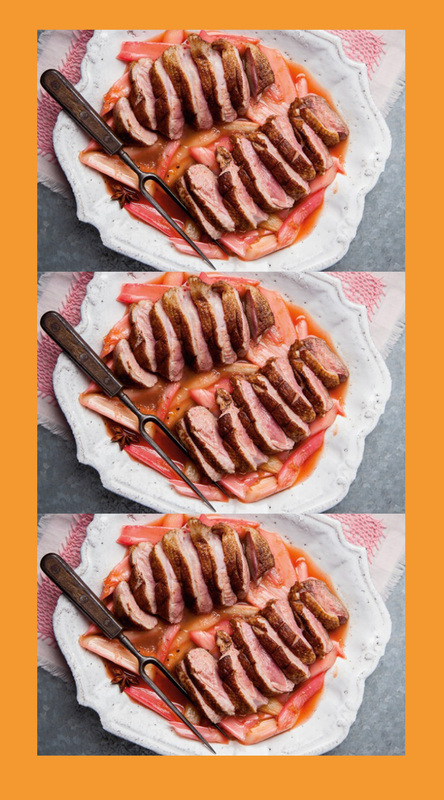 Transfer the duck breasts to the cutting board to rest. Return the pan to the stove. Over medium heat, divide the shallots between the pans and cook until soft. Add the honey, orange juice and lemon juice and reduce by half. Finish the pan sauce by whisking in the butter, seasoning to taste with salt then combine the sauce into one pan. Thinly slice the duck breasts crosswise. 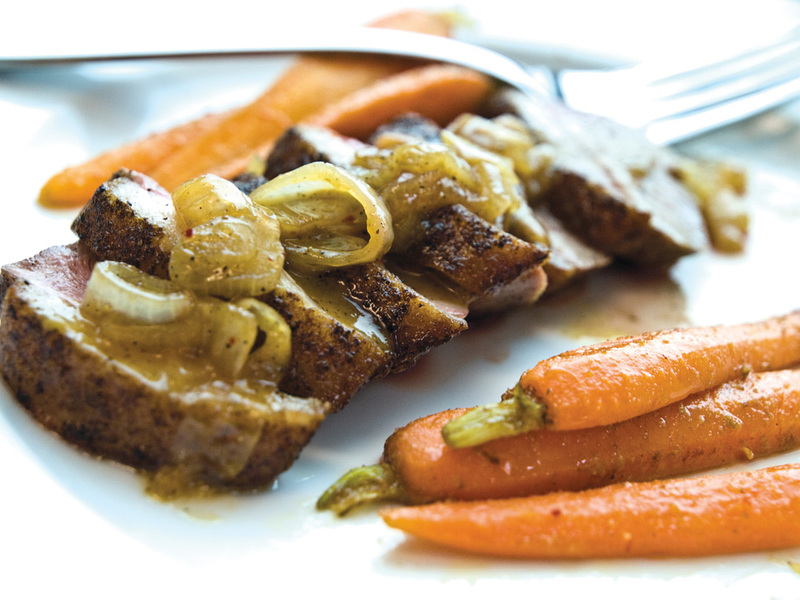 Place the duck slices on the plates, spoon some of the glaze over the duck and serve with the roasted carrots. Duck is always a crowd pleaser! We promise this recipe will be sure to please all, everyone will be raving on about how “QUACKING” good your cooking is. Cut a diamond pattern in the duck skin and rub over the five-spice powder. Heat a frying pan until warm and add the duck breasts, skin-side down. Cook for 4-5 minutes over a medium heat until the fat starts to run out of the skin of the duck. Turn the duck breasts over and cook for a further 3-5 minutes, depending on how well you like duck cooked. Remove from the pan and leave it to rest for about 5 minutes while cooking the rhubarb. Melt the butter in the pan and add the rhubarb and cook for about 1 minute, then add the vinegar, sugar and star anise and bring to a simmer until the rhubarb is just tender. Season to taste. Slice the duck breasts and serve straight away with the rhubarb sauce. 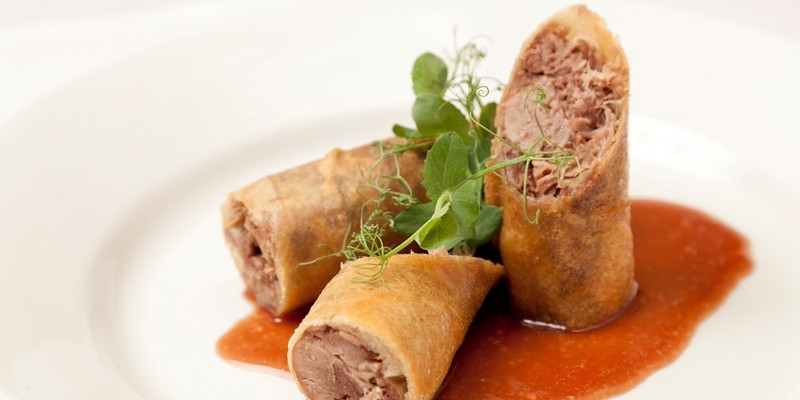 Try this delicious recipe from the hit television show on channel 7 – My Kitchen Rules! To prepare duck, arrange rosemary an garlic over base of a small roasting dish. Season duck all over and place on top. Roast for 1 hour. To make mash, melt butter in a saucepan over medium heat. Cook leeks and garlic, stirring, until soft but not coloured. Stir in thyme and milk. Simmer 5 minutes. Place potatoes in large saucepan of cold salted water. Bring to a gentle boil. Boil until tender. Drain and allow steam to evaporate. Return to saucepan and mash over lowest heat until smooth and water has evaporated. Add leek mixture and beat with a wooden spoon to combine. To make jus, remove duck from roasting dish. Strain off all but 1 tbs of the fat. Place dish medium heat. Add eschallot and garlic and cook until soft. Stir in wine, scraping any crusty bits off base of dish. Simmer until reduced by half. Stir in stock and herbs. Simmer until slightly thickened. Season. Strain. Cook broccolini in a large saucepan of boiling salted water. Drain. Return to pan with butter and juice. Season. Toss to combine. Serve duck, mash and broccolini with jus. 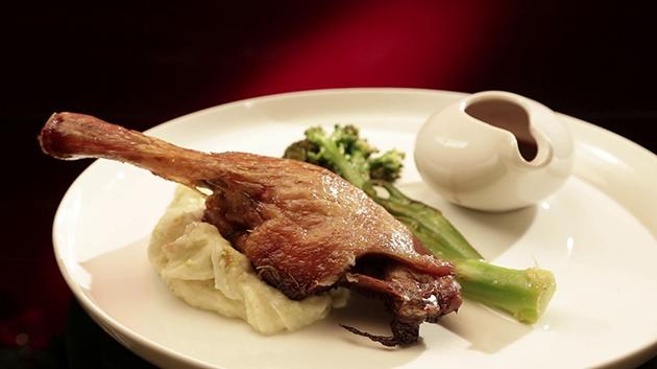 Remove any excess fat from inside the cavity of the duck, then using a sharp knife carefully score the breast and legs all over in crisscross fashion, roughly 1cm apart. Season the duck with salt, pepper and the five-spice, rubbing all over so the flavour catches in all the nooks and crannies. Halve the clementine and place it into the cavity along with the bay leaves. Place the duck in a medium-sized roasting tray, cook at 180°C/350°F/gas 4 for around 1 hour 20 minutes. 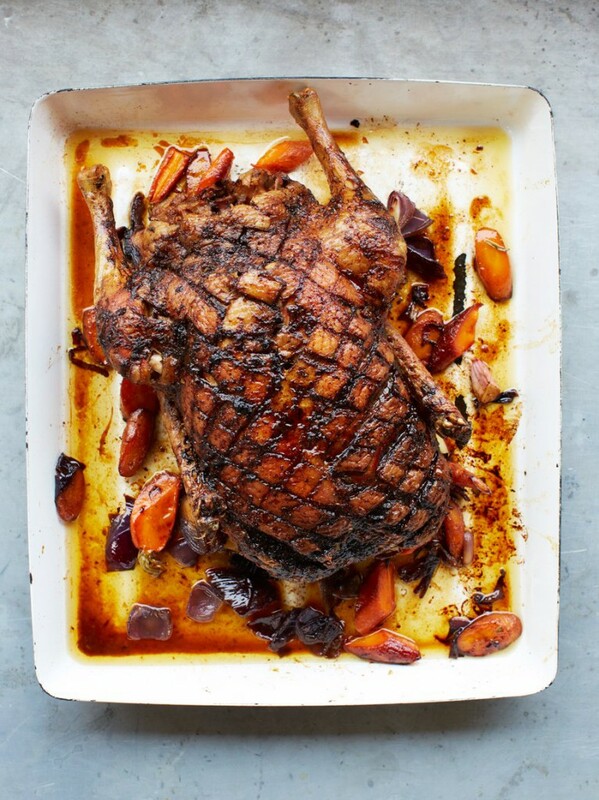 When the time’s up, remove the duck from the oven and drizzle your par-boiled veg (see Gorgeous roast vegetables) with some of the fat from the tray then toss to coat (save the remaining fat for another day). Lift up the duck, scatter the garlic, carrots and onions into the tray and sit the duck back on top. Cook for a further 40 minutes, or until the duck is beautifully crisp and the meat falls easily away from the bone. Remove the duck to the tray of roast veg while you finish your gravy. Add the flour to the broken-down veg, then mash everything together with a potato masher, scraping up all the sticky goodness from the bottom. Place over a medium-high heat. Pour in the Marsala, stir well and let the alcohol cook off for a minute or two. Add the stock, then bring to the boil and reduce to a simmer for around 15 minutes, or until thickened and reduced. Strain through a coarse sieve, skim away any fat from the surface, then season to taste. Shred or carve up the duck, then serve with a jug of gravy, apple and cranberry sauce, crispy roast veg and all the trimmings.